First 5 AmeriCorps members create a mural at Westminster Preschool in South Ontario, California. Wesley Lopez (not pictured), Liliana Perez, Leticia Rivera, and Alex Ruiz make their mark with preschool students at a County of San Bernardino Preschool location. 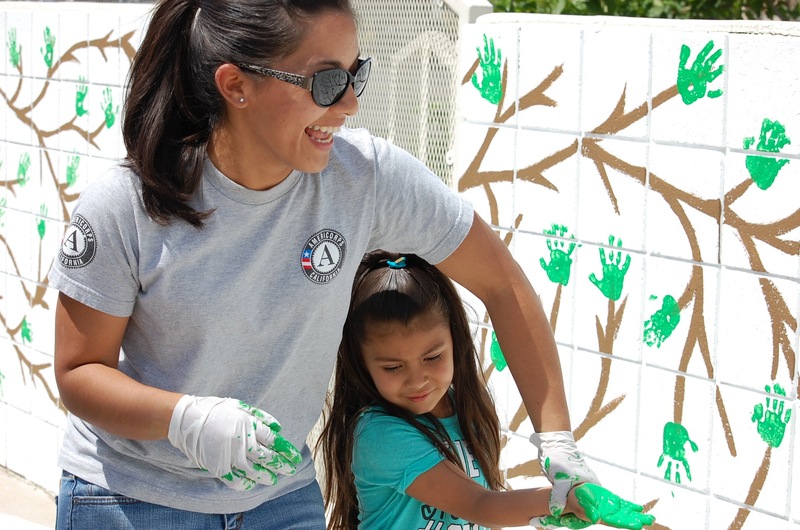 The First 5 San Bernardino AmeriCorps team created a mural with preschoolers and teachers hands on a playground wall that surrounds the children’s play area and a new garden that AmeriCorps also installed on the campus. See the photos to walk through a day of painting and gardening at the campus with AmeriCorps and Westminster preschoolers.